It’s no secret that ESPN’s gambit on an all-new Monday Night Football broadcast booth hasn’t gone according to plan. The biggest lightning rod has been new multi-million dollar analyst Jason Witten who was brought in to replace Jon Gruden and be ESPN’s answer to Tony Romo. However, Witten’s most notable exploits this season have been botched turns of phrase like Aaron Rodgers pulling a “rabbit out of his head” or Cam Newton’s run after catch ability. Then there’s Booger McFarland, who has been roaming the sidelines on the “Booger Mobile,” which has drawn attention for being an unnecessary broadcasting gimmick that ruined the fan experience for people who paid big bucks for seats. At least ESPN put clear glass on the back of it so fans are at the game only have a slightly obstructed view. Finally, Joe Tessitore swapped places with Sean McDonough moving over from one of ESPN’s top college football booths. Tessitore has always had a good reputation among fans as an energetic voice, but it’s certainly been an unenviable task trying to switch over to the NFL, work in a rookie analyst, and try to make sense of the unique setup. The result? ESPN’s high-profile primetime MNF crew ranked a distant last in our NFL broadcast rankings as voted on by readers. (In fact, they received the lowest grade ever received for any broadcast team in any of our previous reader polls.) In spite of the critiques, though, ESPN is pledging on bringing back the trio next year. What remains to be seen is whether or not it’s in the exact same format. An interesting note from Andrew Marchand at the New York Post shows that ESPN could at least be exploring some more traditional options. Marchand reports that McFarland will join Witten and Tessitore in the booth for ESPN International’s broadcast of the Super Bowl. The Post has learned that ESPN International’s broadcast of the Super Bowl will have Tessitore, Witten and McFarland in a traditional booth. It could provide an easy out for 2019 and permanently park the “Booger Mobile” next to Fox’s glowing puck in the “Good job, Good effort” TV sports parking lot. 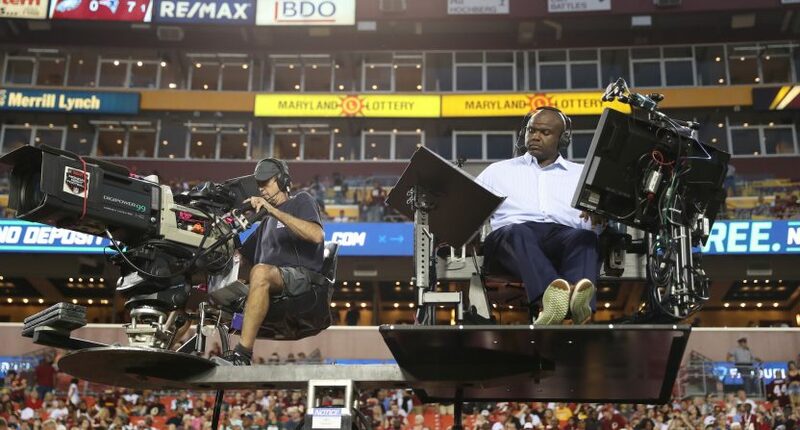 ESPN’s “Monday Night Football” executive producer, Jay Rothman, has repeatedly said McFarland could be the “Charles Barkley of football.” If that is the case, why does ESPN diminish his presence on Monday night by putting him in a high chair on the sideline? There are a couple of explanations here for the switch. The first could be that ESPN is really interested in ditching the Booger Mobile and doing a traditional three-person booth with McFarland, Tessitore, and Witten for next year. The second could be that ESPN isn’t interested in dealing with the Booger Mobile for a broadcast that is only going out internationally. The third could be that the NFL wants no part of dealing with fans corporate partners who paid thousands upon thousands of dollars for Super Bowl sideline seats complaining about the dang Booger Mobile. It’s only speculation trying to figure out what the exact motive truly is in this situation. Whatever the reason, it’s clear that ESPN should at least take advantage of the opportunity to see if putting McFarland in the booth improves the chemistry among the MNF announce team. It couldn’t possibly hurt it at this point. In fact, it’d be fascinating to see how different the season would have been had Witten and McFarland being able to work together alongside Tessitore in the booth. Having a team who has never worked before trying to announce a game together from different locations has often led to disjointed broadcasts where Witten and McFarland talk over and past each other instead of flowing together. Perhaps being in the same physical location can at least improve things somewhat heading into next year. Would that really be enough to turn the tide of opinion for NFL fans, though?